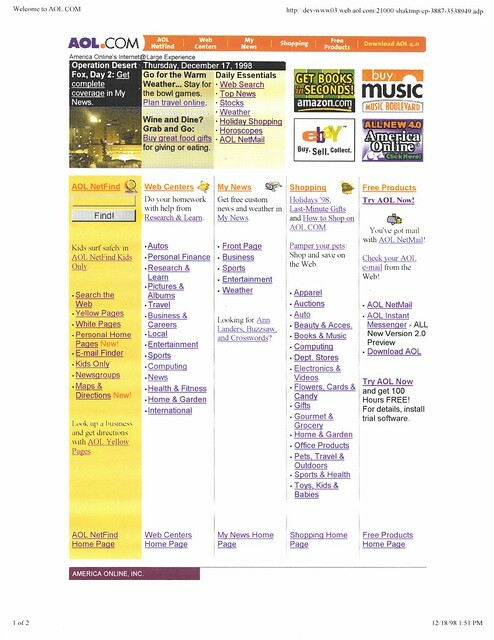 20 Years Ago on AOL.com: Dec. 30, 1998 -- Gwyneth Paltrow in "Shakespeare in Love"
20 Years Ago on AOL.com: Dec. 29, 1998 -- Entertainment Asylum's "You've Got Fans"
December 29, 1998: The lead text promo for cheap fairs to ski destination explicitly references the image (a standard stock photo of a skier shredding); other than that, very generic. The first text promo, though, references voting for entertainers in something called You've Got Fans. 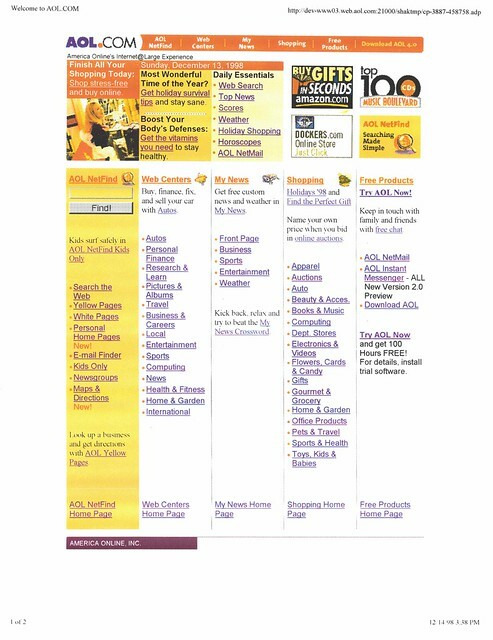 According to the archived press release, the first annual You've Got Fans awards was an Entertainment Asylum crowdvoting contest, claimed in a Wired article to be the "world's largest online awards show." I don't recall (and can't see) if there was a second. 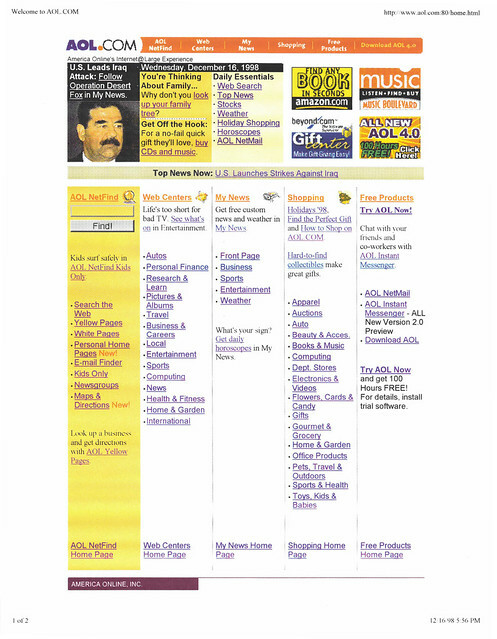 December 27, 1998: The week between Christmas and New Year's was even more generic than usual, with some loose acknowledgement of holiday gifts and upcoming New Year's resolutions. I don't remember if I took time off. I have a feeling I didn't, instead going into the very dead and quiet office to do a few promos and take care of some other work while no one else was around. 20 Years Ago on AOL.com: Dec. 25, 1998 -- Lara Croft for Christmas? December 25, 1998: Nothing says Merry Christmas like a Tomb Raider 3 promo. In a tactical shopping move, we also did a promo featuring tools to help people with their new Christmas computers. 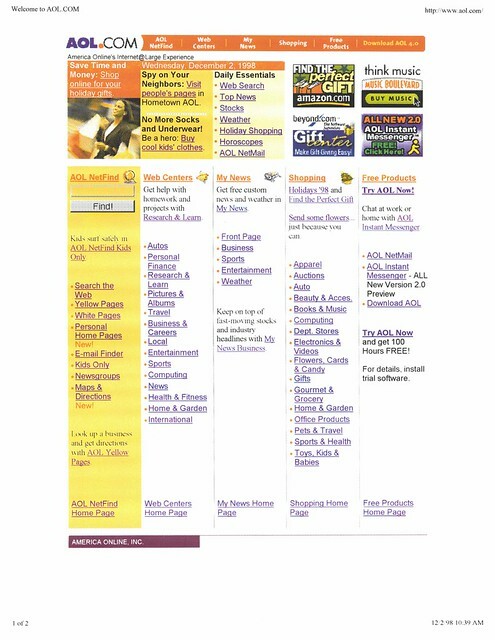 December 24, 1998: For Christmas Eve, we pitched some sort of Mega Sale with a lead promo saying "A Creature Was Stirring... it was your mouse!" December 23, 1998: The lead graphic is Lara Croft (from Tomb Raider III) wearing a Santa hat. At this point, we were way past last-minute gifts (outside of gift cards and such), so we could stop beating the shopping drum so much. 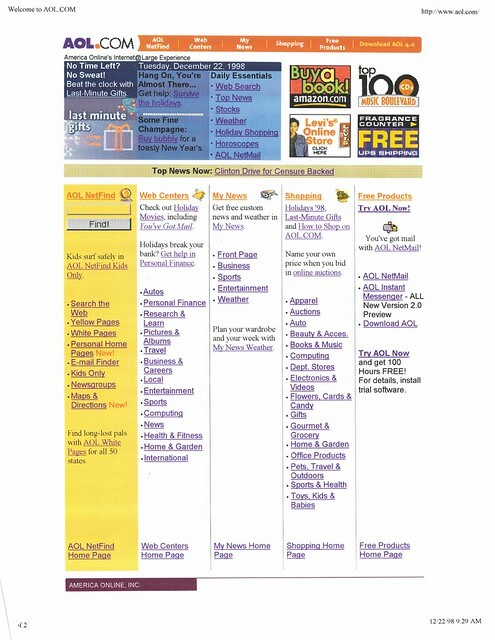 The other text promos were White Pages and buying books online. The top headline is "Whoa, Baby, It's Cold Outside," which leads me to deduce two things: 1. There was a cold snap on the US East Coast, and 2. One of our human editors in the AOL Newsroom was indeed tweaking those headlines after they came off the wire. Below the headline, you can see a late-season holiday customization: A string of mostly non-secular holiday lights. I think they were even animated. 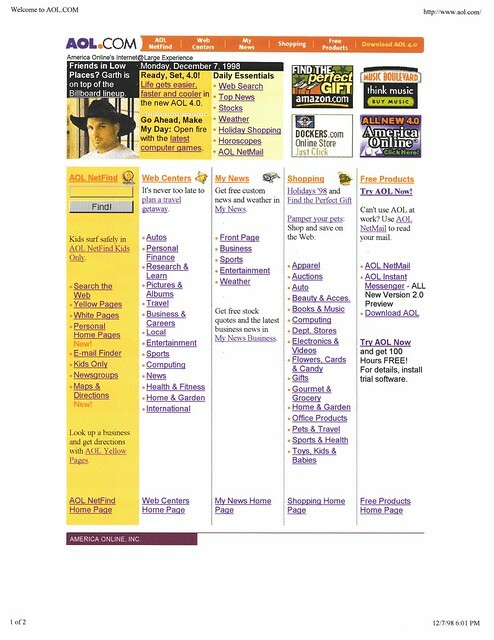 December 22, 1998: We're in the holiday home stretch, which you can see in last minute gifts [sic] promo recycled from just days earlier. 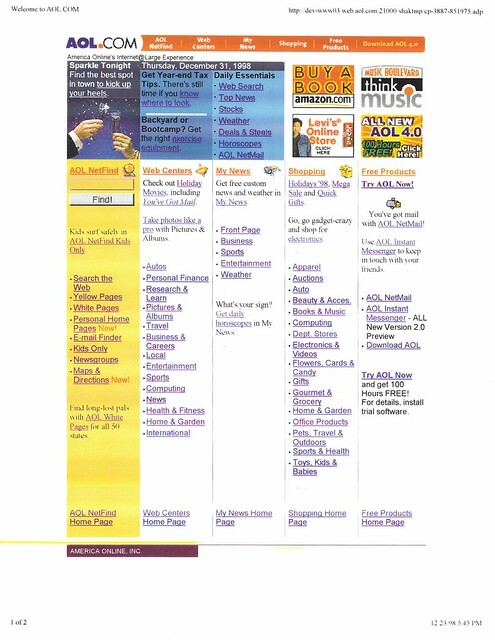 20 Years Ago on AOL.com: Dec. 21, 1998 -- Online Stock Portfolios, and the Beginning of MoveOn.org? 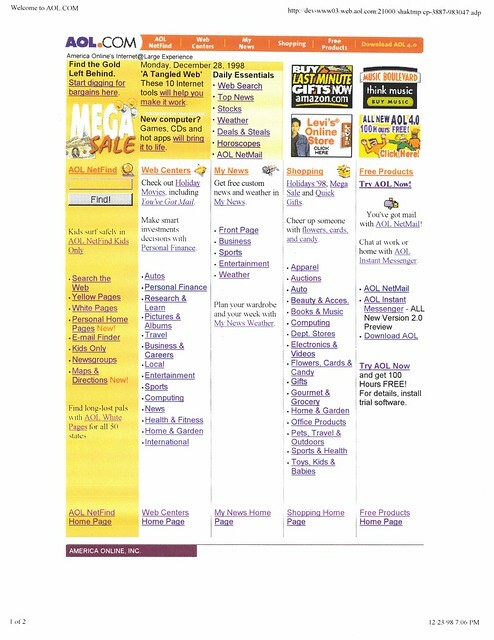 December 21, 1998: Nothing notable about the top promo block: stock portfolios, winter fitness, educational toy shopping. In Clinton impeachment news, the My News headline block says, "Ford, Carter Back Censure Proposal," which you can see included in this Post story (from the following day). As folks might remember, the "Move On" in MoveOn.org originally came from "censure and move on," so in a roundabout way, we're kind of seeing the birth of that group. 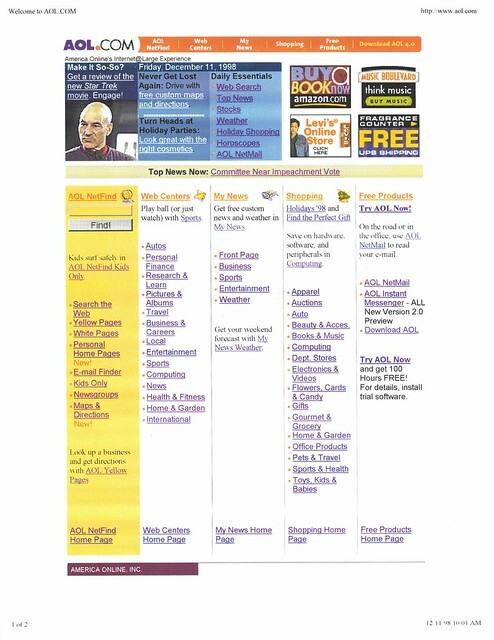 20 Years Ago on AOL.com: Dec. 20, 1998 -- New Cars for 1999, PC-Buying, and Holiday Outfits. Plus, What Was Buzzsaw? 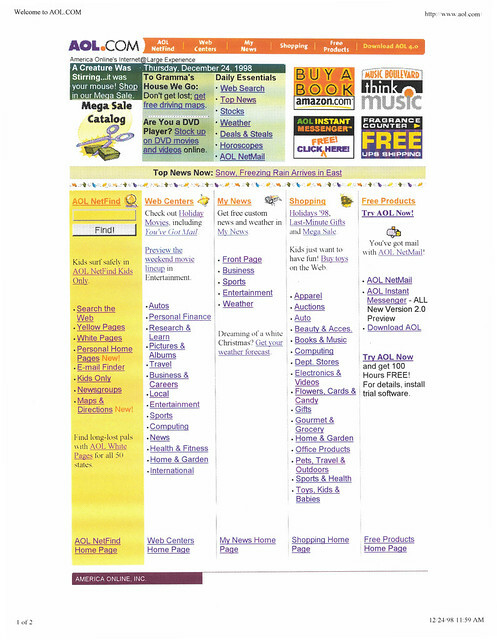 December 20, 1998: The promo block featured a color scheme seemingly inspired by Yellow Cabs, with a standard holiday lineup. 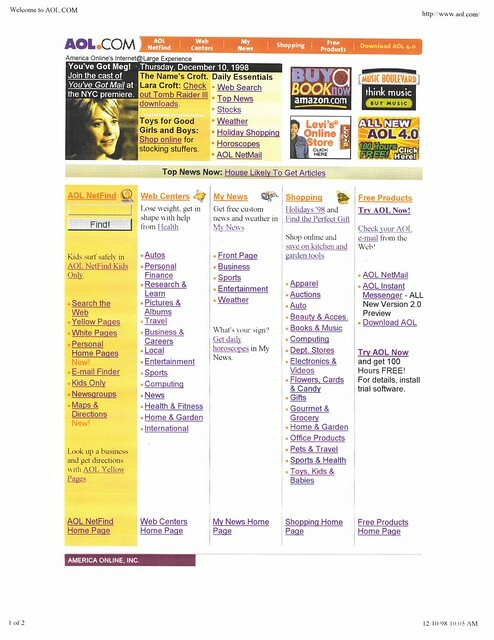 For updates on the Clinton impeachment, we let the dynamic news headline (not seen here) do the work. 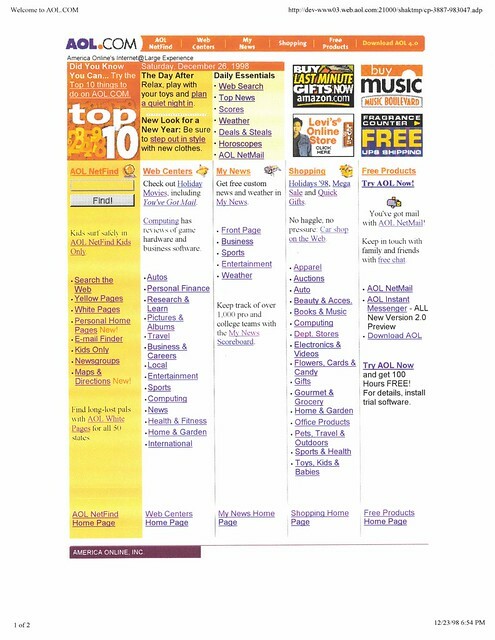 December 19, 1998: Last-minute gifts in the top spot, plus Plan a Night Out and more shopping for gifts that wouldn't arrive until after Christmas. Oh, and it's not reflected in this preview screenshot, but the House voted to impeach President Bill Clinton. I may be conflating memories of the Starr Report or other events from the scandal, but I seem to recall being in the office for this, even though it was a Saturday. Here's the reason: The dynamic My News headline (which we don't see in this preview) worked by pulling in a bit of HTML via an include file; the HTML snippet included the text, link, and a bit of formatting. The My News team, with their eye on the historical weight of the event, decided to pump up the font size so there was a big "CLINTON IMPEACHED" headline in the middle of the page. 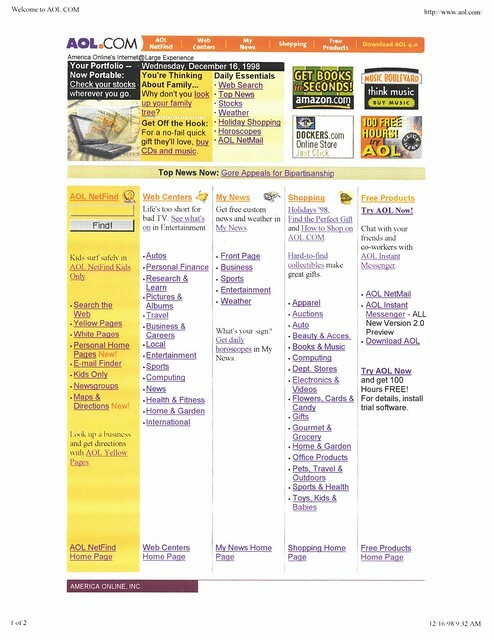 But previously, our managing editor had made the call that, for the AOL.com home page, we'd treat impeachement like any other news event, and give the headline the regular weight. So I worked with the My News team to remove the extra emphasis. 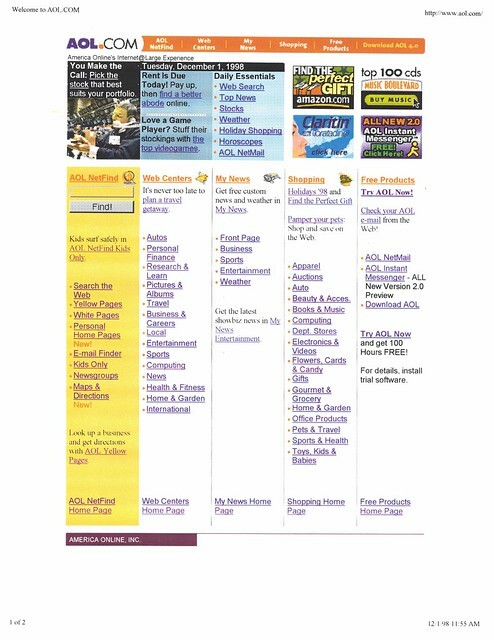 20 Years Ago on AOL.com: Dec. 18, 1998 -- Does "You've Got Mail" Deliver? December 18, 1998: You've Got Mail finally opened, which means we could finally stop promoting it. The other text promos include another riff on the infamous spam headline, "Make Money Fast," and a rhyme for cards, flowers, and candy. December 17, 1998: Continuing on with Day 2 of Operation Desert Fox, the US/UK airstrikes against Iraq. As a preview, this doesn't show the My News dynamic headline. 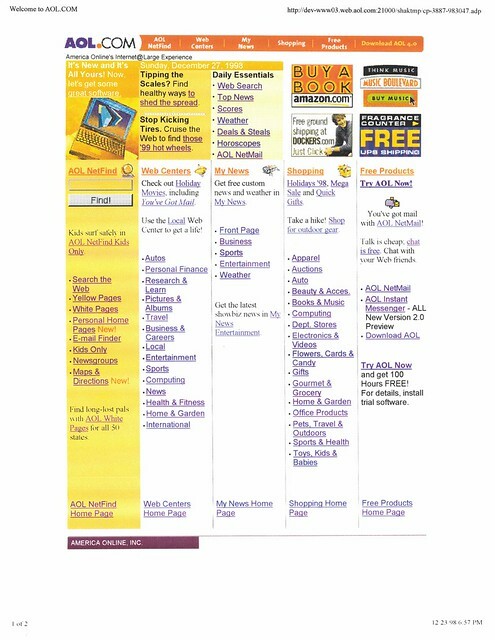 However, this does show a tweak in the Free Products column: The AOL mailbox icon and a little promo that said, "You've got mail with AOL NetMail!" 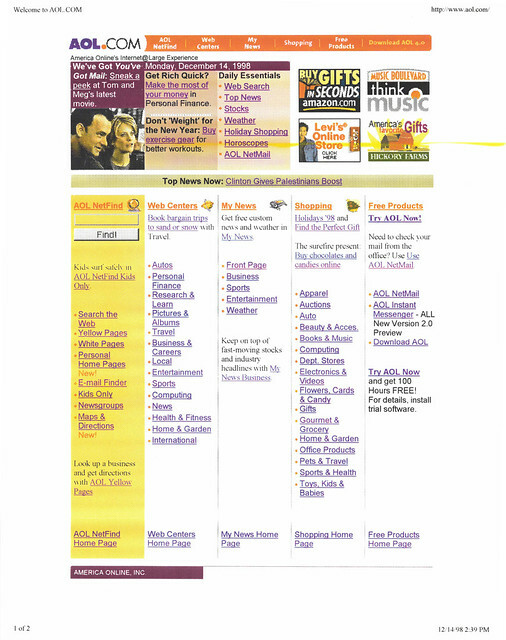 December 15, 1998: More holiday shopping, with the Perfect Gift Catalog and a pragmatic exhortation to buy now to avoid rush shipping fees. 20 Years Ago on AOL.com: Dec. 14, 1998 -- We've Got "You've Got Mail!" December 14, 1998: I like the silly rhythm of the headline promoting synergy. The movie would open later in the week. 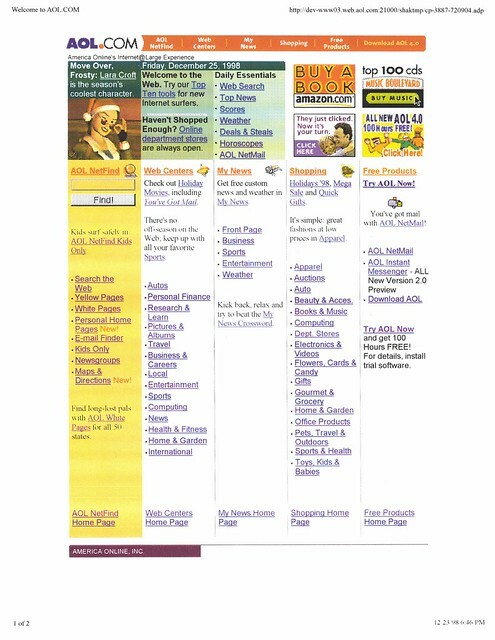 The other text promos featured a "Get Rich Quick?" Personal Finance headline (riffing on fairly common spam subject lines), and a weight/wait pun. 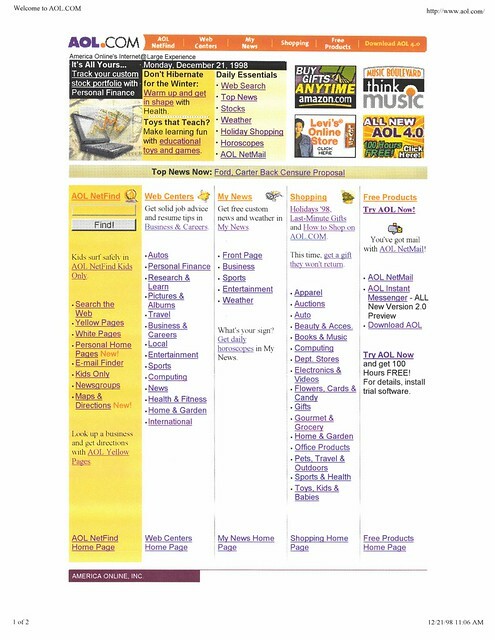 December 12, 1998: Another Furby story; not sure if we were linking to a vendor who had Furbies available at insane markup or if we were just pointing to a news story. The first text promo references the Heisman trophy award ceremony; Ricky Williams took it. December 10, 1998: We went with "You've Got Meg!" to promote the NYC premiere of You've Got Mail, the 2-hour product placement that I still haven't seen. The text promo also references Tomb Raider III downloads. More importantly, we finally added a dynamic news headline onto the page! As I recall, the mechanism was a simple include file that pulled in the top headline from My News, automatically truncating it. 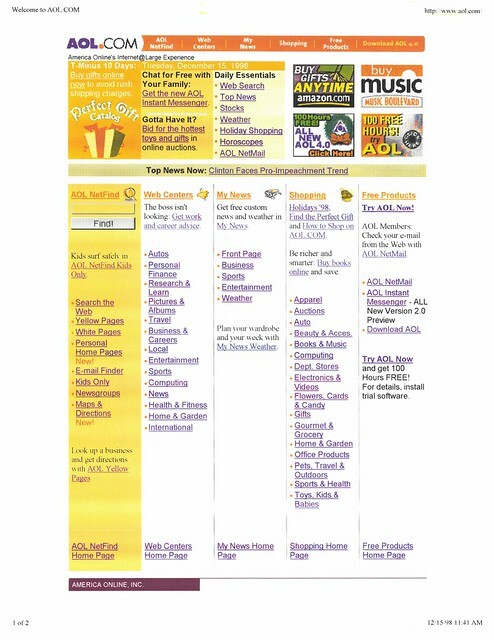 I don't remember at this point if we sent people directly to the article or just to the My News main page. Note that from here on out, you'll only see the news headline block on screenshots pofthe live page; the headline block didn't show up on the preview server. 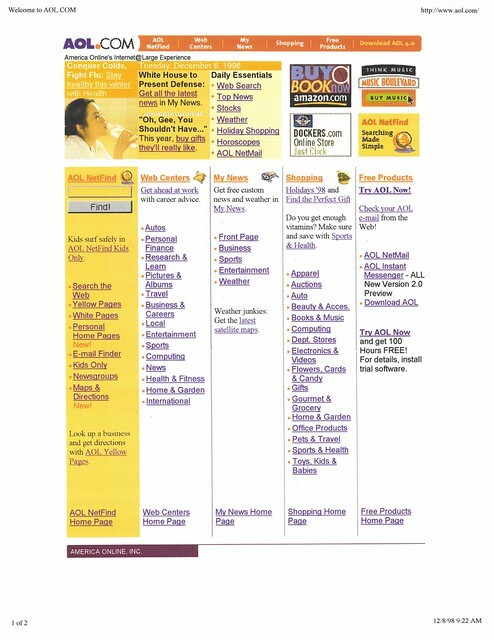 December 7, 1998: We didn't do anything to remember Pearl Harbor, but we did start the day with a graphic promo that read, "How Much Will This Baby Cost? Lowering the price of raising a child." I don't think it was a veiled shopping promo, but I have no idea what else it would have been. We didn't use employee photos very often, but we didn't actually sneak it in; I'm sure we got a release and everything; we even gave a proper photo credit below the fold: "Photo Credit: Erica courtesy of Robin and Will Schermerhorn." 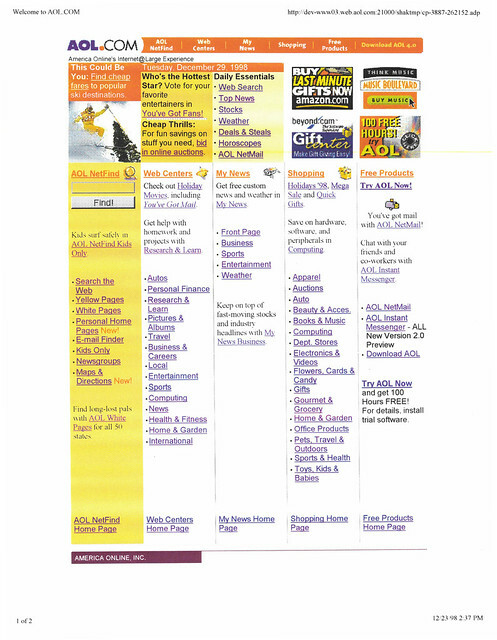 December 6, 1998: Another generic holiday shopping promo, this one with a mild Army of Darkness reference. 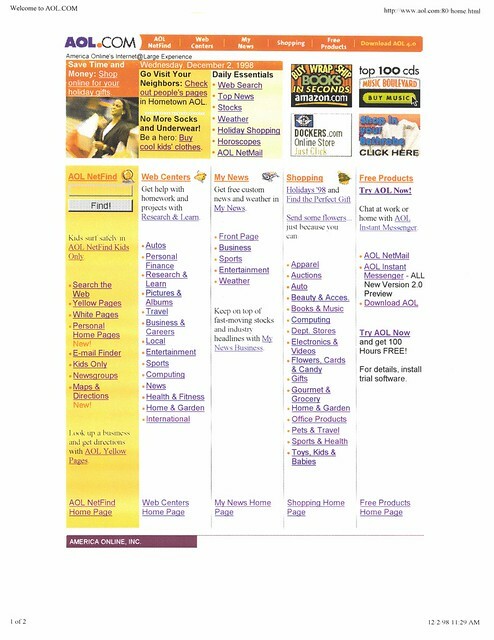 Plus, more shopping, and shareware. 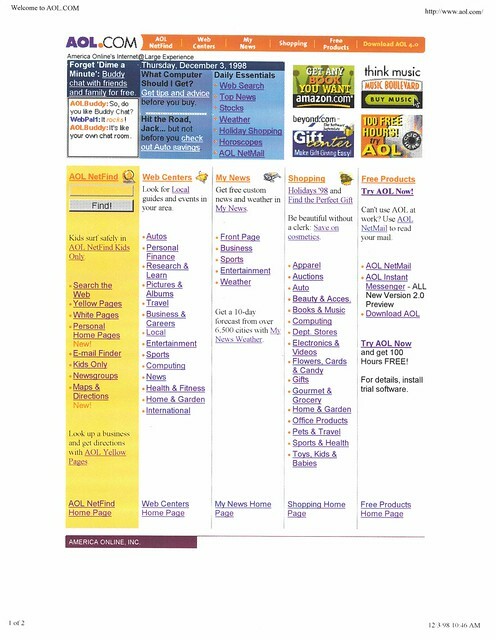 Remember shareware? December 5, 1998: 1998 was the year of the Furby, so we named-checked it for what I'm sure was probably just a generic holiday gift guide. The first text promo references college football and the runup to the Fiesta Bowl, while the second text promo is holiday shopping. 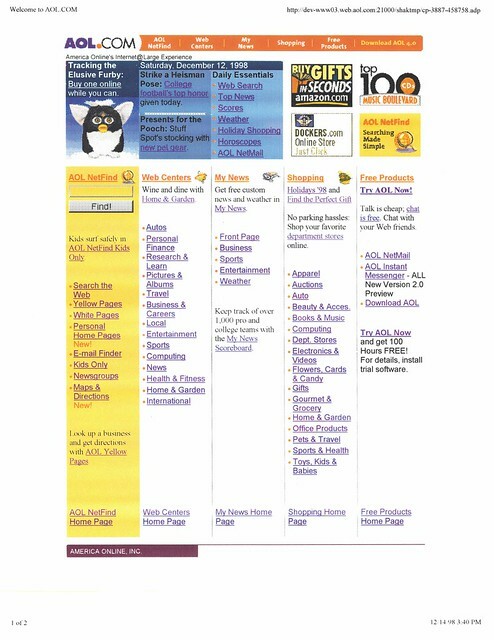 20 Years Ago on AOL.com: Dec. 4, 1998 -- Go 'Psycho'? December 4, 1998: The 1998 remake of Psycho opened, so we featured it in the top spot. Although the image is in color, the rest of the top block is black-and-white in honor of the original. 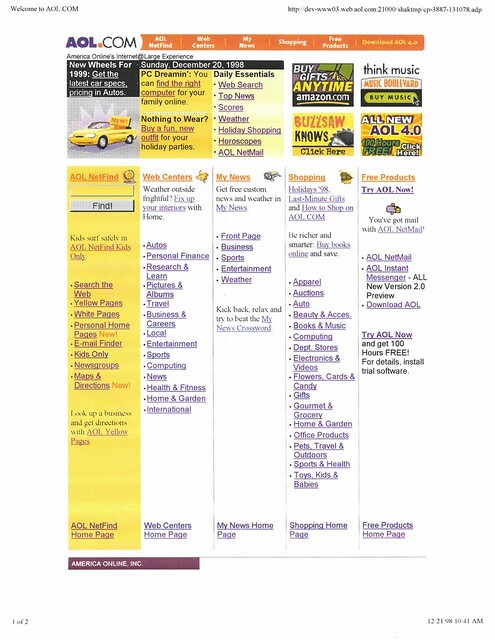 The top text promo headline is "A Good Time, All the Time," which is of course a Spinal Tap reference. 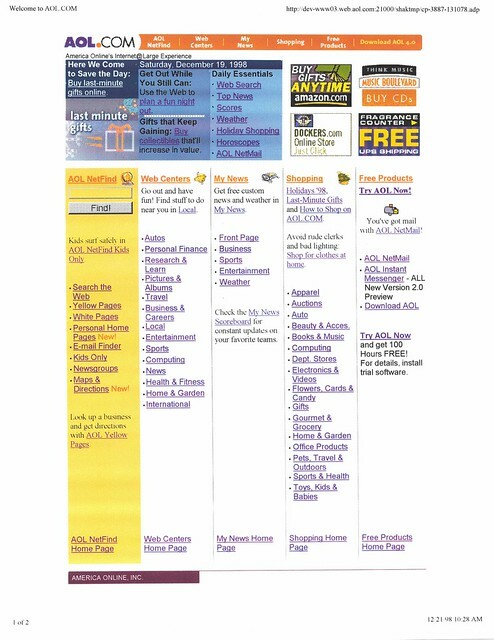 December 3, 1998: Another simulated chat window in the lead promo; "Forget 'Dime a Minute'" refers to either a Sprint or AT&T campaign that advertised calling plans at 10 cents a minute. Of course, trying to link text chat with voice calls is a like trying to compare apples to acetone, but whatever. 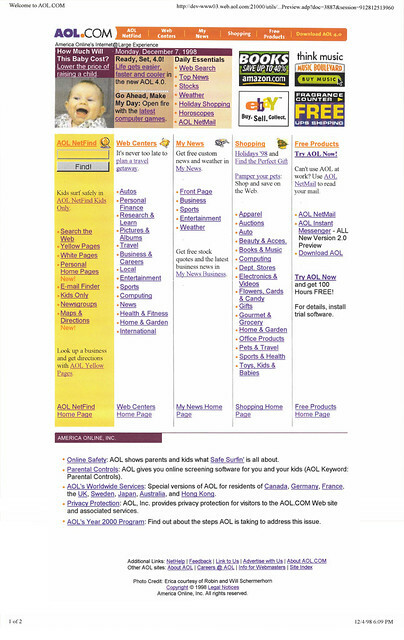 20 Years Ago on AOL.com: Dec. 2, 1998 -- Spy on Your Neighbors? December 2, 1998: We led with a generic holiday shopping promo, but look at the first text promo: It's for Hometown AOL, AOL's web page creation product, and reads "Spy on Your Neighbors: Visit people's pages in Hometown AOL." 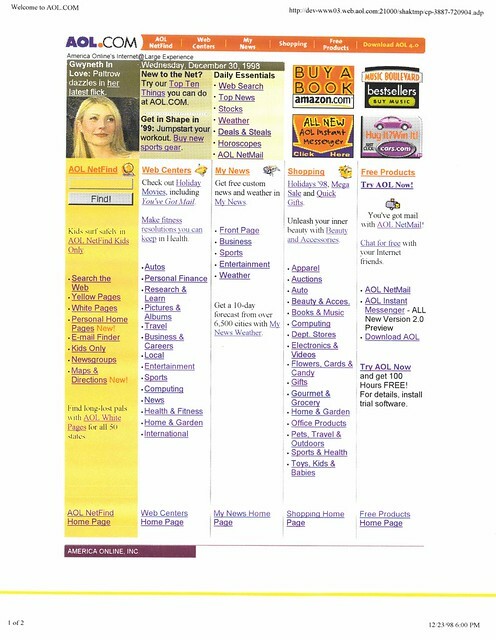 Kind of an odd angle to take a personal web page builder, but whatever, I'm sure I had a reason. Anyway, hat promo lasted until mid-morning, when (I think) our boss noticed and we changed it to the more benign "Go Visit Your Neighbors." December 1, 1998: The graphic promo is a generic stock portfolio promo with a generic trading floor photo; the rest of the lineup is pretty bland, even though the apartment listings text promo acknowledges the first of the month. The laziest kind of timeliness.